1. Place the kale, walnuts, basil, garlic and olive oil in a food processor and blitz, then season. 2. 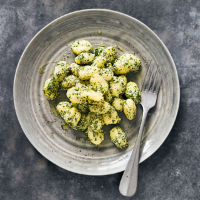 Cook the gnocchi in boiling water for 3 minutes, drain and return to the pan. 3. Add the soft cheese to melt then add the kale pesto and heat for 1 minute. This recipe was first published in Thu Oct 27 12:22:00 BST 2016.